My Sewing area/kids tv playroom that is. The wall unit is Expedit from Ikea. Here is the angle from the tv wall unit. Another Expedit added there and I am using the other white pieces I had from my first set up. And the cutting table area. The wall cabinets and ironing station were clearance at Home Depot a few years ago and so they stayed. I am feeling sooo much better that it is a useable space again. When I have a mess whether I am organizing or not, I just can't focus until it's straightened. There are few baskets here and there that need a home, but some of the Expedit squares are empty so there's room. Now I need to focus on finishing part 2 of the Applecore tutorial and show you what I bought at J'Ellen's House of Fabric. We are new-ish to gardening and decided that this year we would add potatoes to our repertoire. So we quartered some from the pantry that had 'eyes' on them and planted. Well my husband being not too knowledgable about planting...planted a summer squash right next to the potatoes. The squash went like wild fire and basically smothered the poor potato plants. We thought there were no potatoes that could have survived. and my hubby decided to pull the potatoes too. Well wouldn't you know it. So we made potato chips first and the rest? maybe American fries for dinner? I'm not sure but I am super excited that we got potatoes. It was a treat to see my girls digging for them. Next year we are planting them again, away from the Squash. At JEllen's House of Fabric in Lyndhurst, Ohio! 5259 Mayfield Road .... to be exact. 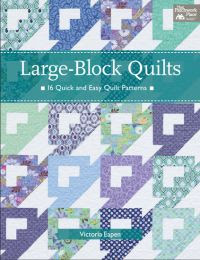 this Saturday August 13th between 10:30am-12:30pm for a book signing of Fresh Fabric Treats. This is Joyce and Sarah. 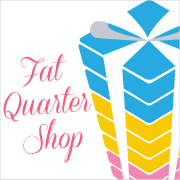 They are very special people and I feel very fortunate that they decided to open their fabric shop here in Northeast Ohio. 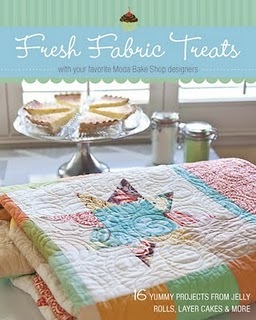 This week is their anniversary week and Joyce has some 'sweet' sales to coordinate with the Fresh Fabric Treats book. Can you guess what she might have on sale? Jelly Rolls and Layer cakes $20! As you know, I knit. p.s. my organizing is still not done. I made successful Sticky Buns from Barefoot Contessa's recipe on the Food network. Like these that I saw on Pinterest. Hmm....don't even get me started about Pinterest. It's addicting. the cupcakes....well the cakes themselves were divine. I whipped up the batter in no time and had them baking. It's a delicious recipe that would make again. Then I tried to make Strawberry Buttercream. 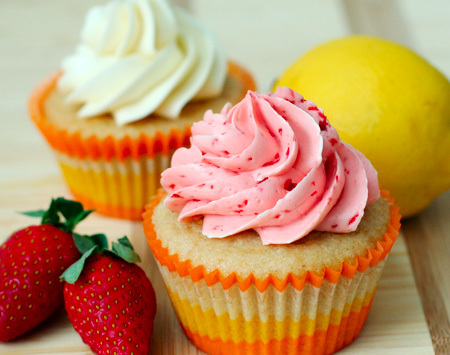 I have never made buttercream. I could go on and on about this but basically I don't know what went wrong. It was perfect until I added the Strawberries. After spending 30 minutes trying to selvage the buttercream, I gave up and used canned frosting. I may never try buttercream again. Then I read the blog post attached to the recipe and realized the recipe creator had the same problem with the icing. I could have avoided using that buttercream recipe had I read the blog post BEFORE baking. This project is the inspiration for this tutorial. 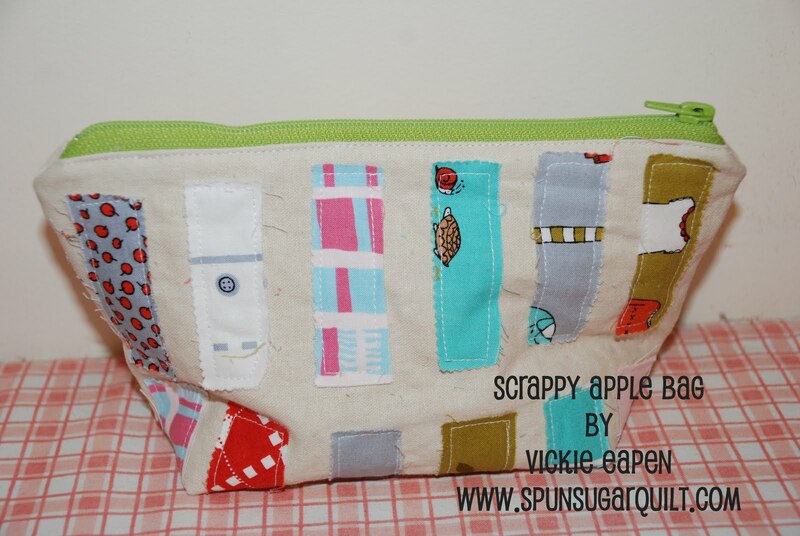 I love the applecore shape and I started this some time ago not realizing how complex it could be to sew curves. 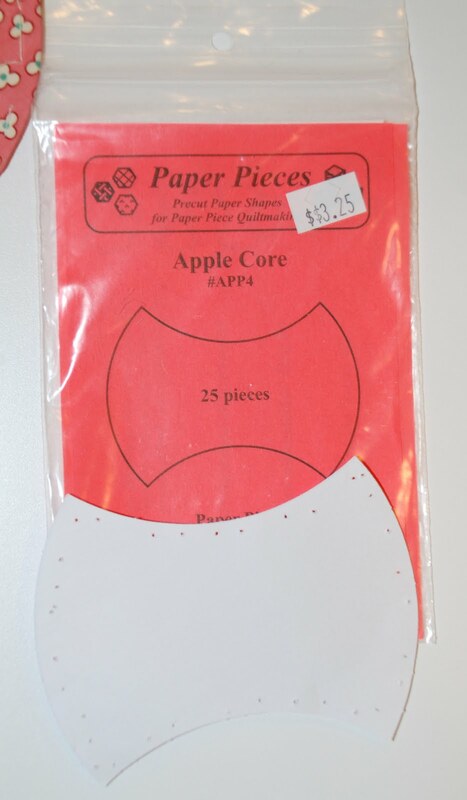 Here is what you need to start your own English Paper Pieced Applecore tablerunner. This will measure about 10 1/2" X 32 1/2". backing fabric 12" X 36"
You can download the applecore pdf template HERE. 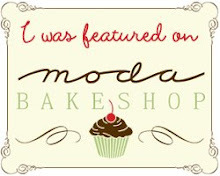 I am going to make this small project right along with you and I chose Ruby by Moda for my feature fabric. 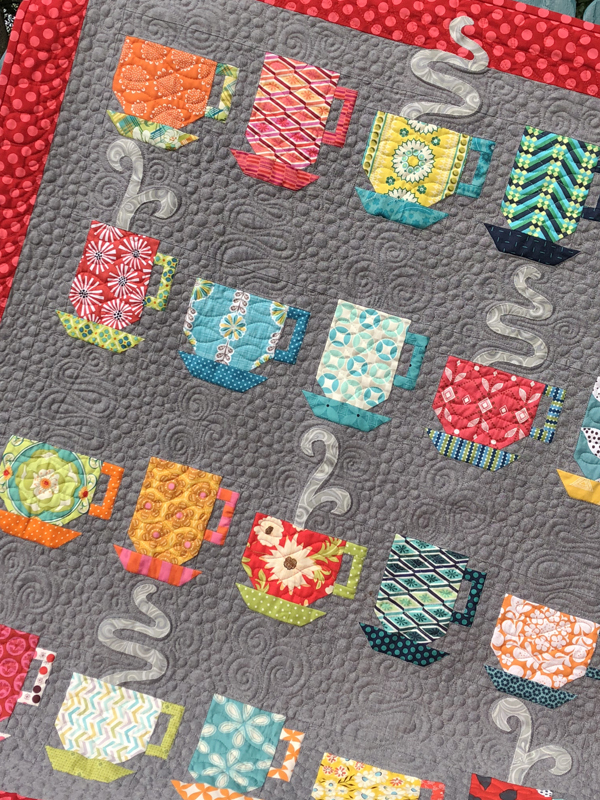 A charm pack of Ruby or charm pack of any fabric would be adequate for this project. You will need at least 4" X 5" rectangles. *note that my applecore has 'holes' in it. I originally sewed through the papers BEFORE I started using the glue stick technique. Place your paper piece onto the rectangle and mark with a pencil a 3/8" seam allowance. I have found that a 1/4" is too small for my comfort level with this project so I used 3/8". After I made 2 or 3 I just eye balled the seam allowance. It is up to you if you would like to mark them all. 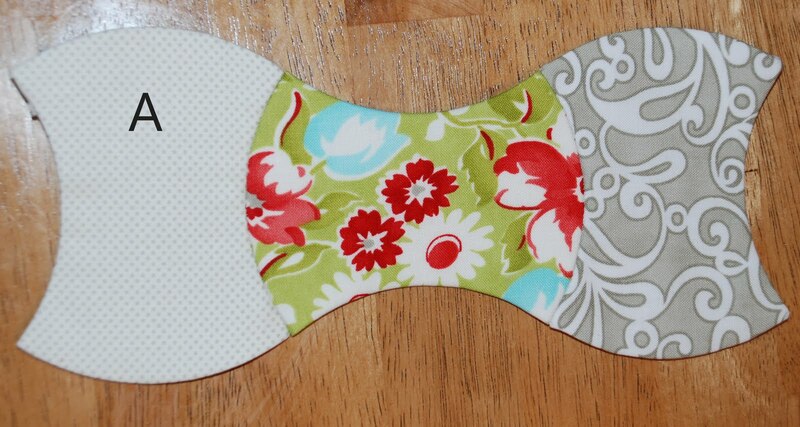 Pin your paper to the wrong side of the fabric and cut out along the seam allowance. Next you need to make small 1/4" cuts in the seam allowance to help you form the fabric to the paper piece. BE CAREFUL not to cut too deeply into the seam allowance. 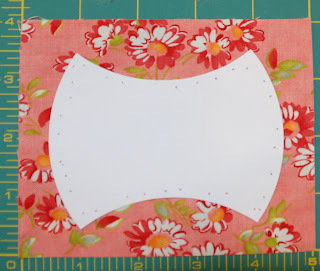 Take your Sewline glue stick and place about 1/2 swipe of glue onto the paper piece edge. Fold the seam allowance over as shown. Continue to do this for both 'inner' curves. Then clip the 'outer' curves and glue and fold. When you get to the corners you must manipulate the fabric and glue by gluing fabric to fabric. I wasn't worried about the neatness of the back of the paper....just the 'tightness' of the point of the applecore. Here is the first finished applecore. It goes pretty quickly since you do not have to sew through the papers. Part 2: How to sew english paper pieced applecores together. will be posted next week to give you some preparation time. 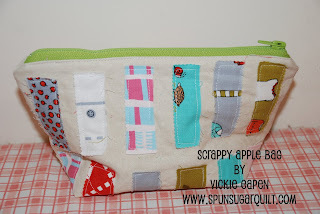 I'd like to know what fabric line you will use or if just scrappy. I look forward to your combinations.